In a friend’s small organic family garden, I picked a perfectly ripe tomato straight from the vine and took a bite. The tangy sweet explosion of flavor made me unleash an impromptu falsetto. Hooked, I headed over to the San Pedro Farmers Market in search of the pure taste of summer. There I spotted a pile of the color-splashed bulbous beauties tumbling onto the table from a wooden crate — heirloom tomatoes. Though they are often affectionately called “ugly,” the so-called ugliness of heirloom tomatoes can be credited with making them far superior in flavor to typical supermarket varieties. As the saying goes, don’t judge a book by its cover. Ripe, round, crimson tomatoes line the bins and shelves of supermarkets, and are available anytime we desire. But, if you get your tomatoes from the supermarket, chances are you’ve been eating bland, thick-skinned, mealy-textured tomato wraiths — maybe not even realizing that you’ve been duped! Picked green to survive packaging and transportation, likely stored in damaging refrigerator temperatures, and rendered red in color with ethylene gas, the tomatoes look ripe and delicious, but under the surface are far from it. We wish growers would strive to maximize taste, but their financial incentives lie in maximizing the number of “red objects they put in a box,” says Horticulturist Harry Klee. To make matters worse, recent findings show that genetic tinkering from decades ago is also to blame for the inferior state of modern tomatoes. Some 70 years ago, tomato breeders found that a gene-mutation rendered tomatoes a uniform red color when ripe. The effect was visually appealing to consumers, and the mutation was soon bred into almost all modern tomato varieties. A June 2012 study published in the journal Science finds that, in addition to the uniform ripening effects, this gene mutation also has the effect of suppressing natural processes in the tomato fruit that yield significantly higher levels of sugars and carotenoids, or in other words, superior flavor. While we probably won’t see the benefits of these findings in supermarket produce sections any time soon, the researchers do point out that heirloom tomatoes and many wild species do not have the offending mutation. Coming in a wide variety of colors, sizes, and shapes, heirloom tomatoes typically look far from what we see under the florescent lights of mega markets. Bite into one, you will say “Now that’s a tomato!” What better time than now to taste how fantastic and different they are from the usual suspects? 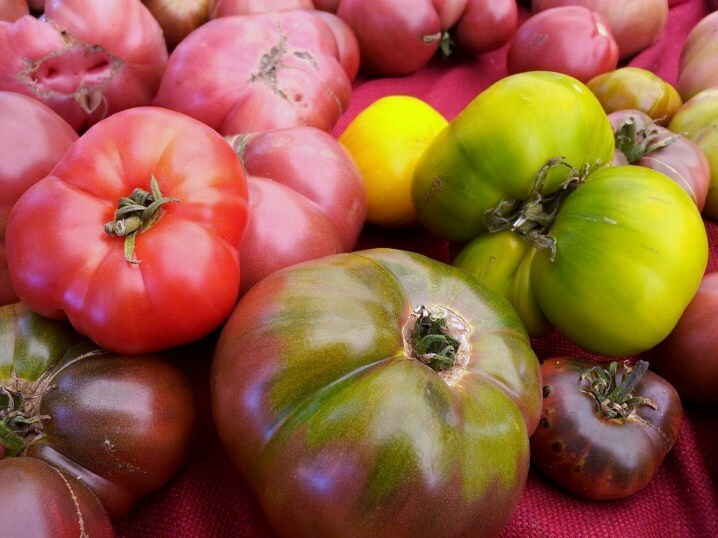 My personal favorite variety of heirloom tomato is the Cherokee purple, which is large and dark reddish purple in color with shoulders boldly splashed in green. They can take on particularly interesting shapes, sometimes even resembling conjoined tomato-twins, but their unusual appearance should never dissuade your adoration. Like most heirloom tomato varieties, they are heavy for their size, succulently juicy, and have a thin skin that yields almost effortlessly, revealing the richly flavored tender flesh and jelly-like juice within. What makes Cherokee purples stand out is their incredible flavor that is all at once deep and meaty yet fresh and light. My first bite of the summer literally transfixed my attention; I got lost standing in the kitchen as the pleasure washed over me. In reverence to the fact that heirlooms achieve such tantalizing perfection in their unadulterated form, I prefer to prepare them minimally fussed around with. Aside from simply sliced with perhaps a sprinkle of salt, here is a simple but knock-your-socks-off-good preparation. Chunks of sliced heirloom tomato provide a face-ful of juicy meatiness with tart and sweet notes bursting from the decadent flesh. 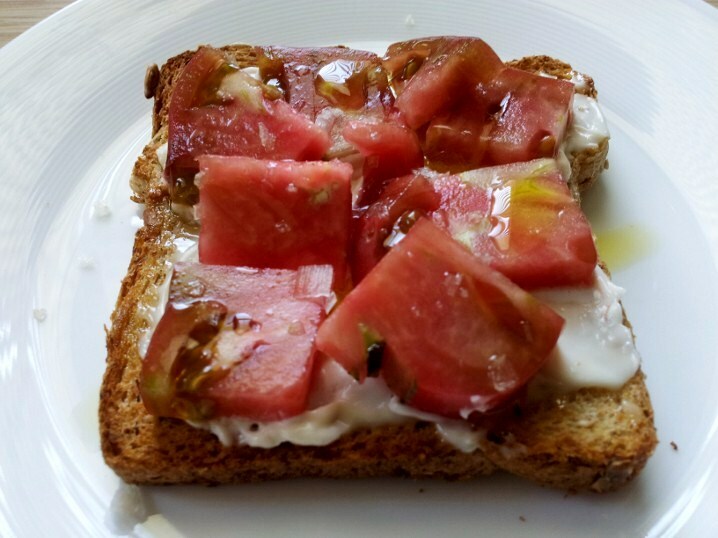 The tomatoes are amplified by briny Maldon sea salt flakes and earthy extra virgin olive oil accompanied by a generous smear of Best Foods mayonnaise on a light multigrain toast. It’s a summertime dream on a plate. What is your favorite heirloom tomato variety and how will you eat it? Hi Samantha! Nice to hear from you :). I know, to die for! Once you’ve tasted an amazing tomato and realize what’s been sitting in the grocery store, it is hard to go back. I guess you’ll be all the more thrilled when tomato season returns.